Is Your Mutual Fund’s Performance Affected by the Downfall of Telecom Sector? Do you have a mutual fund investment which has exposure to Telecom sector? Read to find out how it will affect the performance of your fund. Last week was a dark week for the investors. In India, the share market is going through harsh times. S&P BSE Sensex witnessed a dip of more than 1500 points, whereas Nifty 50 is trading lower by 350 points in just three months. As a result, all the sector indices are facing a negative note with increasing selling pressure. But the worst affected one is the Telecom Sector. This sector is the most vulnerable and swings extremely with a minor fluctuation in the market. The performance candles of this sector have been facing south after the market crash of 2008 and are unable to make a comeback since then. Let us see how a slight tweak in the nature of this sector affects the mutual fund industry. It is worth remarking that the whole telecom sector has not been experiencing the results in-line with its ability since a long time. Though the count of the telecom subscribers has increased 3 times from the year 2008 to reach the point of 1.2 billion in 2017, the investors have nothing to celebrate. 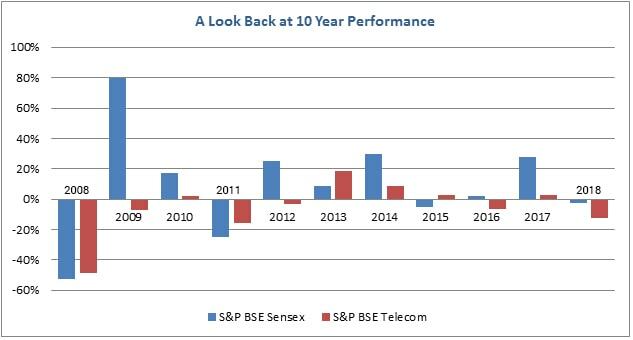 By the end of 2017, BSE Sensex went up 3.25 times in nine years, but the Telecom Index had not recovered from the trauma of 2008. It was only the launch of 4G services in 2013 that increased the number of mobile users in the country and boosted the growth of the sector. Nevertheless, most of the constituents companies of communication industry are still facing the threats of dissolution or merger to sustain the continuous losses. But, the relatively prominent names of the industry such as Bharti Airtel, Idea Cellular, Vodafone, etc., have still kept the customers as well as investors engaged to keep up the spirit of the other players. As per the combination of historical and current evidence, the telecom companies are going through stress under high debt, lack of pricing power, and intense competition. Apart from these internal factors, high spectrum costs and regulatory issues have also hampered the sector’s growth. At times, the telecom industry has gone through commotion due to the new entrants that disrupt the market with low-cost data services and degrade the revenue of the existing players. In the current scenario, the consumers are benefited from reduced costs, new players are fighting for their share, and investors are suffering. The stock market has a direct influence on the mutual fund industry. The sectoral gains or losses have a critical impact on the performances of the mutual funds. 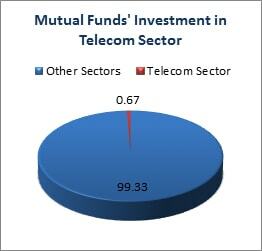 Out of the 23.17 lakh crore of its AUM, the industry invests less than 1% in the telecom sector. Let us consider some of the funds and find out whether the percentage of asset allocation in the Telecom sector affects their performances or not. Below is the list of funds which currently have the highest percentage of exposure to the Telecom sector, along with their 1-year annualized returns, and the companies in which they invest in. As we can observe, the funds under consideration belong to the different categories and they have been differently affected by the inclusion of stocks related to the communication industry. Bharti Airtel Ltd., Bharti Infratel Ltd., and Idea Cellular Ltd. are the ones who have majorly acquired the asset concentrations of the selected funds. With no one in their competition, Bharti Airtel and Infratel have been able to perform exceptionally well due to their vast and consistent network coverage. Other than that, no one made it even to yield positive returns during the past year. According to the data, only the large cap funds were able to beat their respective benchmarks and category as their percentage of allocation was even more in the consistently performing construction and FMCG sectors. The multi-cap fund has managed to touch its benchmark returns by maintaining a balance between the stocks of cyclical and sensitive sectors. According to the Economic Survey, 2018, the Government has been working to connect the remote and rural regions with the mobile networks and bring in digitalization in the economy with the support of all the stakeholders. For the same purpose, the Department of Telecom is expected to propose the new National Telecom Policy 2018 for the benefits of both the consumers and operators. The inclusion of over 4 million people in this sector is encouraging the employment rate of the country, directly or indirectly. All these developments may trigger the lift in the performance of the telecom sector and related companies and ultimately benefit the investors. Telecom is a sensitive sector that readily gets influenced by the macro-economic factors and industry sentiments. As we have observed, the performances of the funds did not deviate much due to their exposure to the underperforming Telecom sector. But, experts generally advise the investors to avoid the investments which show high fluctuations during the market cycles. Unless you are passionate to generate considerable profits that come with high-risk probability, you must avoid this sector. Instead of being sector specific, investors are suggested to go for the long-term growth-oriented investment plans that would actually help them multiply their money.